Dab onto stain with a clean cloth or sponge. This can remove red wine, blood, yellowed stains from sweat and deodorant, grass, even stains that have been laundered and are old. On Thanksgiving we tried this with an old off-white muslin tablecloth with a blue, tan and berry colored pattern. A glass of Zinfandel spilled over a large portion of the fabric. After trying all the classic remedies (like cancel red wine with white wine) and having little success, I went onto Google and found a few recipes. The recipe for this best stain removal got the most traffic and comments online, and was the only one that worked. And boy did it work: without even rinsing the red was COMPLETELY gone, the print was not affected; it didn’t bleach the off-white color. It was as though the wine was never spilled. I have since used it on heavier duty fabrics with an old clean toothbrush, and have poured it directly onto stains to pretreat before washing. I have used this combination on synthetics, natural fibers, and even dry clean only fabrics like silk! 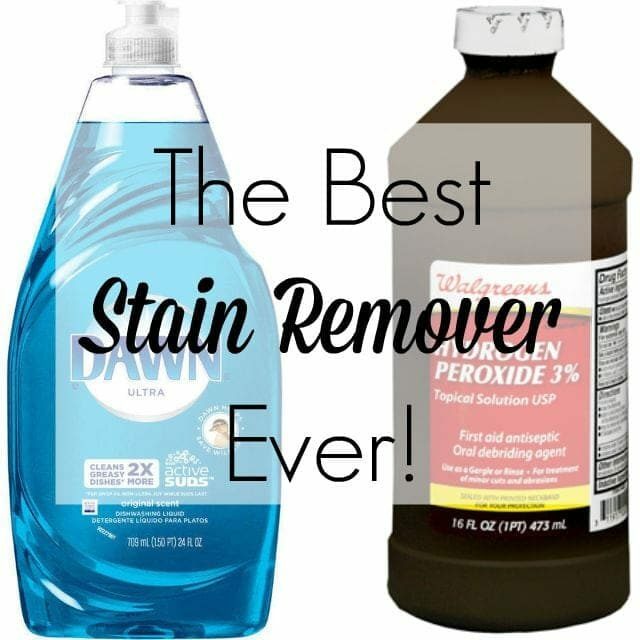 The best, cheapest, and most effective stain remover I have ever used! One part Dawn to two parts peroxide, though I’ve found if it’s not exact it still works great. I have makeup on my “silk” blouse. I have put dawn on it and some of it came out. Can I still use the dawn and peroxide on the silk blouse? Also, can spot clean or do I have to wash it? I have tried it on faux silk no problem, but I did was after on the gentle cycle because the solution will leave a spot. Do you know if the non-concentrated DAWN works as well as the concentrated? I’ve used the Dawn I find in the grocery store and it works great. Just use the Blue Dawn, none with additional ingredients. Thanks for the quick response! I’ll try it with the non-concentrated…it’s blue too. One tip: If you make up enough to have some left over in a bottle, LABEL THAT BOTTLE. Otherwise you will be like me, rummaging through cupboards, wondering where that bright blue stuff went to and where that spray bottle of clear liquid came from. It took me ten minutes to realize that the peroxide bleaches out the blue in the Dawn. The Mystery of the Missing Stain Remover solved!! I believe hydrogen peroxide loses its potency after being exposed to light and air so don’t make up too big a batch at a time. Do you need to make it fresh each time or can it be saved in a container and used when needed? Unfortunately it needs to be fresh each time to get the power of the peroxide. I’ve gotten to where I gauge a squirt of Dawn, a splash of peroxide and dab (or if it’s tougher fabric, scrub). I keep both at my washer and often use as a pretreater! I mix a full bottle then put it back in the peroxide bottle and put the sprayer nozzel in that. The dark bottle keeps it active. Yep, the classic Dawn dishwashing liquid! in a hidden place first. What is DAWN? Is it liquid detergent, dishwashing liquid, fabric conditioner? I haven’t come across it here so I’m hoping to find an equivalent as I have A LOT of old stains to remove! Haha! I’m not sure what you’re asking. The post is about peroxide and Dawn, both which can be found at Amazon and many markets. Allie do you know if this would work on sample sale items that have sample written on them? What perfect time for me to find your blog!!!! I spilled on myself just last night! Hope this works!!! I can’t wait to try this- thanks for the tip! When I used to do wedding coordination we would use Shout wipes on the fabric – most fabrics like organza, satin, etc. have a bit of synthetic fabric in them which makes them really receptive to classic stain removers. Just try in a hidden place first. Hi Allie, thanks for the recipe and i have to say that i love your blog. guess what, i’m egyptian so you have an expanding readership! i just would like to make sure that the Dawn liquid is the dish liquid stuff, is it so? I would love to use that recipe on my wedding dress that “drank” a whole glass of RED wine at the end of my wedding SEVEN months ago and i have been hesitant to use anything on it since and wasn’t sure even what to use. i’ve tried a hydrogen peroxide and washing liquid mix once on a white shirt and it worked perfectly after soaking it for a few hours. i hope this works too. my dress was not lace, was some fluffy kind of organza. I use dawn undiluted on salad dressing oil spots on my tops (I never fail to drop what I’m eating on my shirt front),it has removed stains even after they have gone through a dryer session. I learned about it from washing raw sheeps wool in preparation for hand spinning, it is a gentle grease cutter. I keep a huge bottle under the kitchen sink and one of the small bottles on the counter and in the laundry room. I will try it with the peroxide though on tougher stuff. Yup! I used this LAST year for thanksgiving, on an expensive off-white tablecloth with a fall leaf pattern that had an entire glass of red wine spilled on it. I’ve since used it for (pardon me) menstrual blood stains. It works perfectly for that too. You don’t even need to dab – you just can just pour straight from whatever you mixed it in. I guess that uses up more solution, though. Thank you! I already have a few things in mind that could use this treatment… And it’s so simple!